Heavy Duty Material: 100% High quality stainless steel, PVD multi-layer plating process, let the shower head glossy and smooth mirror-like and easy cleaning, as well as super anti-corrosion and anti-oxidation performance. The thickened joint is to prevent breakage, and the filter gasket ensures secondary filtration to keep your health. Saving Water: Our shower head keeps the water flow rate being 2.5 GPM, which can save 30% water. The water will come out in one second after turning on the tap, and can stop dripping in one second after turning off, water-saving environmental protection. No Tool Installation: Only 2 steps to install the shower head - remove the original one and install the NearMoon shower head with hands, no tool is required. The whole process spends few minutes. 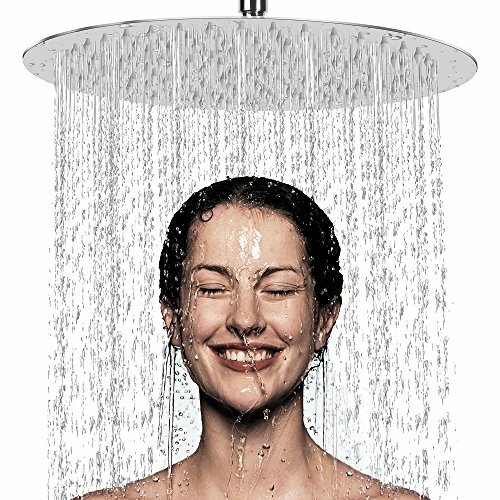 Best Shower Experience: The waterfall from 12 inch super large shower head with more than 150 silicone nozzles cover your full body, massage your skin just like doing the natural SPA. Rotating Connector: The swivel ball design in connector allows to adjust the angle of the shower head in 360°, let you have a variety of shower experiences. Ultra-thin Design and Advanced Air Booster Technology: Double pressure boost from thickness and air-pushing offer consistent powerful rainfall shower experience even under low water pressure. An Extra Filters: We provide one more filters for bonus, just for replacement after long term usage. For any reason, if our product doesn't meet your expectation or anything goes wrong, you are covered with our 30 days no-question-asked money back policy and 2 years product warranty. Any concern when you use our product, please feel free to contact us. We will reply in 24 hours, and try our best to solve issues.  LEAK PROOF AND RUSTPROTECTION - Our Shower head is made of high quality solid 100% stainless steel, durable with the highest rust resistance and long service life. To prevent leaking, we use the best soft rubber gasket and teflon tape.  SELF-CLEANING SOFT SILICONE NOZZLES - No more to worry about the cleaning of your shower head! The self-cleaning design of the silicone nozzles keeps health and save your time. Morever, we use the food-grade silicone for the nozzles, make sure your safety and health when you enjoy bathing.  EASY INSTALL AND ADJUSTABLE -Working with all standard size shower arms. Easy installation in wall-mounted or ceiling-mounted shower arms without any tools in few minutes. A mini wrench is also attached in case you are lack of strenth to tighten. With the swivel ball connector design, you will have the best shower experience ever.  PERFECT MATCH WITH ALL BATHROOMDECOR - The big surface mirror-like chrome finish makes the showerhead beautiful and perfect match with any bathroom decor. No need to worry if you have selected a matching color or shape. Moreover, the ultra-thin and smooth design enhances the complete view and gives it a modern touch, which expresses only elegance.